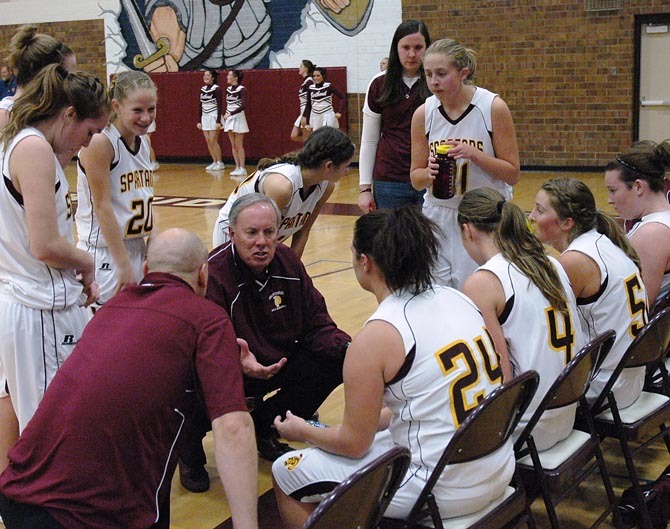 Saturday night the Berthoud High girls basketball team posted a win in their final game of the Spartan Basketball Invite with a 42-28 thumping of Northridge. The victory was the Lady Spartans’ fourth on the season but only their first of the past week’s tournament. Like the previous two games for Berthoud, Saturday night’s contest was one-sided but this time in the home team’s favor. The Lady Spartans out-scored the Grizzlies by 12 points in the combined second and third periods. Led by Senior Julia Perry, who scored 12 of her team-high 16 in the second and third periods, the Spartans took control of the game. Perry’s shooting was hot from every area of the court. When asked about her performance and finding a rhythm she said, “Yeah, I could just feel it.” Berthoud took a 20-13 lead into halftime and extended it to 31-17 by the end of the third period. Senior Megan McGinn contributed 12 points, 10 of which came in the second half of the game as the Spartans pulled away. Northridge junior Kaylyn Smith was by far the most dominant player for the Grizzlies. Smith accounted for 17 of the Grizzlies 28 points as her team’s primary ball-handler. Berthoud was routinely rotating their defense in Smith’s direction and doing all they could to limit the damage. The Lady Spartans will host Denver-based Bishop Machebeuf on Saturday, December 18 for their final game before the three-week winter break. Site contents copyright © 2019 Recorder Online	except as noted. All rights reserved. | 82 queries in 1.199 seconds.